Belgian Burqa Ban Takes Effect — Who's Next? Shall be punished by a fine of €15 to €25 and imprisonment for one to seven days, or one of these penalties, those who, except for contrary legal provisions, appear in places accessible to the public with their faces masked or concealed in whole or in part, such as not to be recognizable. Exceptions can be made for certain types of work and festivals. Fines are automatically multiplied by a factor of 5.5, bringing the maximum assessment to €137.50 (around $200). Belgium follows France, the first Western nation to banish face coverings from its streets. 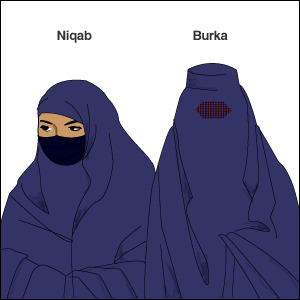 Like the French law that took effect on April 11, Belgium's is broad in nature, applying to virtually all public spaces and making no specific mention of burqas or niqabs, despite having been inspired by their proliferation. Unlike the French law, Belgium's includes jail time among the penalties for wearers and introduces no new punishments for strong-arming others to conceal themselves. Italy. On August 2, a parliamentary commission approved a draft law that forbids public face covering. The bill, which also features huge fines and up to a year behind bars for those convicted of bullying others into hiding their faces, is set to be considered by the full legislature as early as September. The Netherlands. Having previously promised to ban the burqa in return for critical support from Geert Wilders and his Freedom Party, the governing coalition reiterated this pledge in June when it announced sweeping plans to jettison failed multicultural policies. Finally, an important lesson is conveyed by the Belgian law going into effect just hours after anti-Islamic terrorist Anders Behring Breivik murdered dozens of Norwegians on July 22. In his manifesto, Breivik rejects "illusions of democratic change" and argues that only revolutionary violence can thwart the Islamization of the West. He is wrong — and the steady legislative march to proscribe criminal-enabling and female-subjugating Islamist attire proves it. A democratic defense of Western societies is far from impossible; the only question is one of resolve. But if sufficient willpower can be mustered in response to the burqa and niqab, it can be mustered in response to other Islamist encroachments as well.